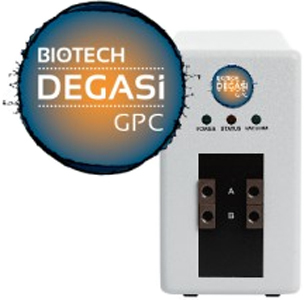 DEGASi GPC is the right choice of degasser if you are working with 100% organic solvents in your fluidic line. Example of application areas where this degasser is successfully used are GPC (Gel Permeation Chromatography) and Normal Phase Chromatography. DEGASi GPC uses the same 480 µl Systec AF degassing membrane as used in DEGASi Classic. The main difference compared with the DEGASi Classic is that we use a stented version of the vacuum chamber in the DEGASi GPC. The stent is a short piece of a stainless steel tube placed inside the ends of the degassing membrane, in order to make the internal ferrule in the bulkhead to get a better grip. This solution makes an even more secure internal connection when working with 100% organic solvents in the fluidic line. With the highly permeable Systec AF membrane an internal degasser chamber volume of only 480µl is sufficient to give you excellent degassing efficiency up to flow rates of approximately 3ml/min. The time the liquid spends inside the vacuum chamber is correlated to the degassing efficiency, so with higher flow rate the degassing efficiency will be lowered. In many cases the 480µl vacuum chamber can be used at 5ml/min with sufficient degassing.